Written by: Carrie Hampton alias the SAFARI TART! Seasoned travellers will be interested in the Odzala Discovery Camps in the Odzala-Kokoua National Park of the remote north of the Republic of Congo’s river basin. It’s the world’s second largest tropical rainforest after the Amazon, and one of the earth’s largest lungs, playing an essential role in global climate control. The region has been a National Park since 1935 – making it one of the oldest on the African continent. Odzala has other faces than the rainforest with vast savannah in the south and wide, meandering rivers crossing the region. 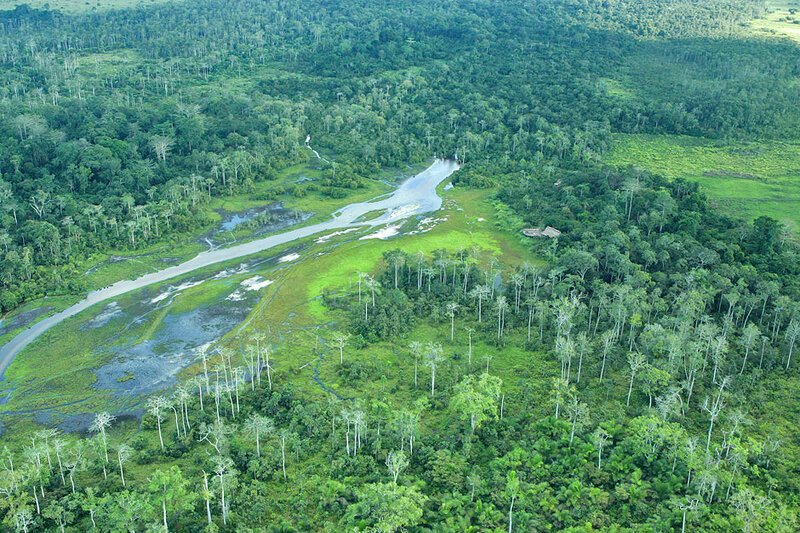 A distinctive feature of Odzala are marshy clearings in the middle of an ocean of trees called bais. Even the shiest inhabitants of Odzala like forest elephants and gorillas come here to drink and take in precious minerals and salts contained in the bai soils. Over 400 bird species and 100 different mammal species are found here, including western lowland gorillas, chimpanzees and red-tailed monkeys along with forest buffalo, sitatunga (a rare sight anywhere on safari) and duikers antelopes not much larger than rabbits. Herds of shy forest elephant move along ancient pathways, avoiding the 70 villages, some with just a handful of inhabitants. The local people are primarily Bantu and forest dwellers (pygmies). There are three camps; Ngaga, Mboko and Lango. Ngaga Camp in primary forest just outside the park boundary, overlooks a beautiful open glade and is within overlapping ranges of several groups of western lowland gorillas. Two of the gorilla groups are becoming habituated to being watched. It’s a focal point for world-class research and gives unforgettable primate encounters. Ngaga Camp’s unique design evokes the fun of childhood tree houses, with six canopy rooms with wraparound walkways. Mboko Camp has 12 guest rooms extending along the banks of a tributary watering a lush meadow-like savannah. It’s the interface between tropical rainforest and grasslands, with hundreds of towering termite mounds creating an other-worldly panorama. Watch out for the forest buffalo, forest elephant and spotted hyena. Lango Camp with it’s six bedrooms has one of the most arresting views of any camp in Africa! Raised high the camp spans the forest gallery and beyond to the marshy bai, which holds a magnetic attraction to huge flocks of green pigeons and grey parrots, as well as herds of forest buffalo by day and forest elephants by night. In the south-central part of Odzala with its variety of converging habitats and rivers, the highlight is travelling on the waters in by motorboat, traditional mokoro or kayak and exploring the streams and marshes on foot in safety – a truly immersive experience! One thing’s for sure – you will be one of very few who have visited this remote area and if you get there before me, I’ll be very jealous.